The real win is that I served this to my very-soon-husband-to-be and he didn’t even notice my switch of hand. Nope, not even when I asked him if he noticed any difference. ~ makes enough for 4. 1 stick of celery, sliced. 2 carrots, I dice my carrot, but if you prefer a smooth bolognese you can grate it. 1 clove of garlic, sliced finely. 250 grams of beef mince, I use lean to cut the amount of fat. Selection of fresh herbs, I used rosemary and thyme, optional. 100 grams of cooked puy lentils. I use pre-packaged puy lentils. To keep the cost down you could cook large batches and freeze them. Under a low heat add the onions, celery, carrots and garlic. Stir till starting to soften (you can add a little oil at this point – but I try and avoid it). Add the beef mince, making sure it breaks up and doesn’t brown too quickly. Throw in the herbs, and the chopped tomatoes. I usually half fill the tomato tin with hot water and add at this stage. Stir all the ingredients together and place the lid on. Stir occasionally to ensure it doesn’t stick to the bottom of the pan – adding more water if it is starting to look too dry. Cook for around 50 minutes, still under the low heat. After 50 minutes, stir in the puy lentils, and leave for a further 10 minutes. (During this time you should cook your pasta). Before serving remove the bay leaves. Voila! 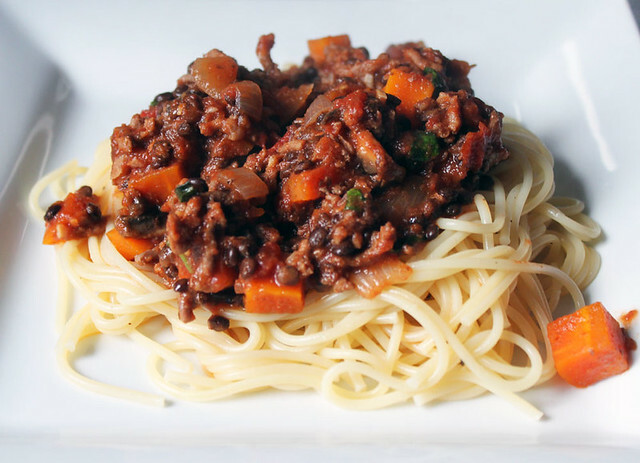 A perfect bolognese sauce with half the red meat! I usually split this portion in two, one for the freezer and one for that evenings dinner. If you have a batch frozen, simply defrost and reheat till piping hot (you may need to add more water).